From previous paragraphs we learned that no practical method exists for measuring the SVR available to the pilot at decision height and that, for low visibility approaches, RVR measured along the runway is used to provide a reasonable likelihood of visual contact on the approach at or before DH and to provide an adequate visual segment to the flare, touch down and roll-out. 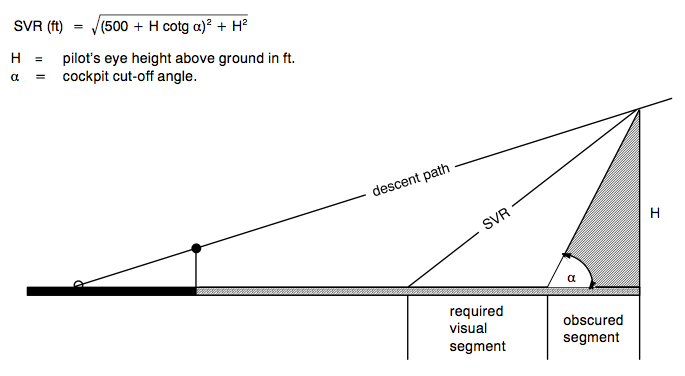 The length of the visual segment, required as external visual reference, determines, together with the length of the obscured segment, due to the cockpit cut-off angle, the total SVR. By using a correlation factor, depending on the required approach success probability, the required SVR can now be transformed into a RVR value. Experience has shown that the correlation factor between the measured RVR and the SVR available at decision height can vary. During homogeneous fog or low visibility conditions, a SVR/RVR ratio of 1.0 can be used since the measured RVR closely approximates the SVR. However, the correlation factor can vary considerably (up to 0,5) in other conditions, such as inhomogeneous fogs, snow, blowing dust, shallow fog and torrential rain. All conditions should therefore be taken into account in setting the SVR/RVR ratio for deriving RVR. One must also take into account the capabilities, limitations and accuracy of RVR reports, as discussed in previous paragraphs. Furthermore in low daytime visibilities, a bright light can be seen further than an object. As daytime visibilities increase, even a high intensity light will fade into the background and substitution of runway visibility would therefore be more accurate. Under certain conditions of daytime restrictions to visibility, runway paint markings are of greater help than the lighting system. The use of landing lights at night, specially during deep fog conditions, will adversely affect the visibility, although a nightlanding without landing lights is not particularly recommended. Landing lights should therefore be used judiciously. Many operators require the availability of RVR measurements by one or more transmissometers or human observers. If for a particular runway more than one RVR value is given in the weather report, the usability of that runway for landing must be based on the RVR value for the touch down zone. The RVRs for the mid point roll-out end of that runway may be used as an extra information, but should never be less than 125 m for those cases where a manually roll-out may be required.